To this day, the distinct radio voice of Hans Hogendoorn, to many listeners in the Netherlands brings back happy memories of the station where he began his impressive broadcasting career: Radio Noordzee Internationaal (RNI). 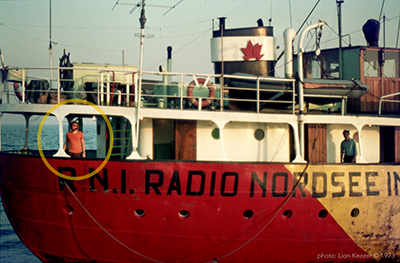 In the early 70s, Hans was part of the original Dutch radio crew on board RNI's colourful ship the MEBO II. 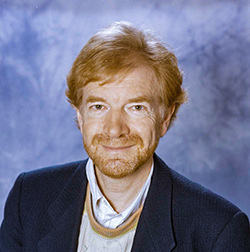 Dutch pirate radio 'Godfather' Joost den Draayer (Radio Veronica's former PD), who had also joined the ranks of RNI, discovered Hans' talent and had sent him out to the ship as a newsreader. Under the pseudonym 'Hans ten Hooge' his recognizable voice could be heard reading the daily news, but soon Hans and other DJ's on board created the immense popular drive-time show 'Driemaster' a daily live show with updates on life on board the ship. His Dutch version of the famous pirate jingle 'Going Back in Time on the Sounds of the Nation, It's a Caroline Flashback' became his legendary voicing signature that later got him his job as official voice-over for NOS radio (The Dutch BBC), where he can still be heard today. Hans fits the Mi Amigo International team perfectly, as its crew mainly consists of DJs, who have learned the 'Free Radio trade' themselves on notorious offshore radio stations such as Radio Caroline, Radio Mi Amigo, The Voice of Peace, Swinging Radio England and Laser 558. He will be the first DJ to add RNI to that impressive list of legendary stations, helping the team to do an even better job in 'Bringing Back the Golden Era of Offshore Radio'. Even broadcasting to Europe on shortwave comes natural to Hans Hogendoorn, who for many years presented and directed the international programs of 'Radio Netherlands World Service', something the Dutch fondly remember as well: listening to shortwave transistor radios during happy holidays, to catch the news, weather and messages from home. His music shows on Radio Mi Amigo International can be heard as part of the Dutch weekend live programmes, see our programme schedule for air times.